This product contains 25 calories per 2 tbsp. Contains 0 g of lactose per serving. Package Yield: About 3 cups. Package not intended for microwave use. Water, Hydrogenated Vegetable Oil (Coconut & Palm Kernel Oils), High Fructose Corn Syrup, Corn Syrup, Skim Milk, Contains Less than 2% of Light Cream, Sodium Caseinate, Natural and Artificial Flavor, Xanthan and Guar Gums, Polysorbate 60, Sorbitan Monostearate, Sodium Polyphosphate, Beta Carotene (Color). • To Thaw: Place unopened tub in refrigerator for 5 hours. 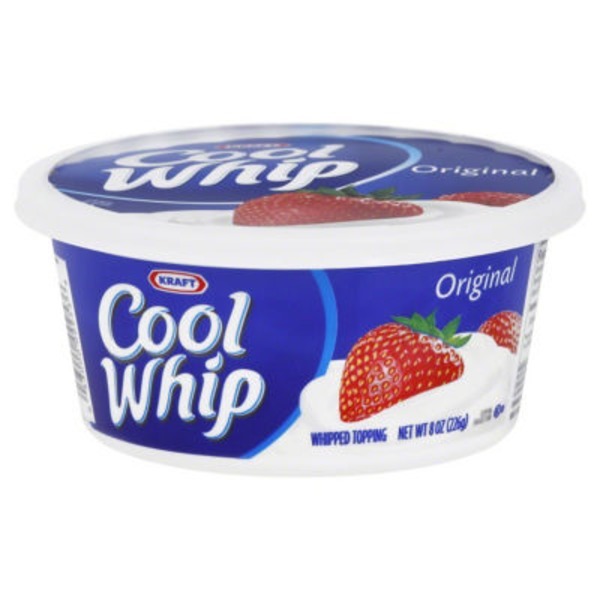 Do not stir.• For Best Results: Do not thaw Cool Whip on countertop or in microwave. Excessive stirring or heat will cause product to soften and become watery.• Package Yield: About 41/2 cups. Storage: Keeps fresh in refrigerator 2 weeks. May be refrozen for longer storage.